We have just been awarded a Certificate of Excellence by Trip Advisor, which now hangs proudly on the side of our building in the form of a large banner. Look out for it, along with our landmark letterbox! Several weeks ago we also won an award for the garden - what a complete surprise that was! Loving these long warmer evenings and more of a chance to play in the garden. A great time for a bit of relaxing, especially in a motel with air conditioning! Remove some stress out of the silly season and take advantage of our cheap rates while we still have units available - spend less on accommodation and more on the "time-out" you deserve! Base yourself here for the convenience of the nearby Northlands or Merivale Malls, or the short trip into the city centre. Our herb, flower and veggie plants are really starting to take off with this heat and our guests are enjoying watching the prolific growth. The courgettes, tomatoes and other summer goodies have been nestled into the garden between the flowering lupins and cosmos interspersed with the marigolds and pyrethrum daisies so as to avoid having to use any nasty chemical sprays. Last year there was an abudance of delicious fresh food in our main garden, with plenty of fresh herbs to feed every guest staying here - summer is indeed a wonderful season! More garden pics to follow shortly! If you're visiting Christchurch, let us advise you of all the local attractions that may be of interest to you. Both of us being Christchurch born and raised means we know our stuff! So, if you're looking for a quiet, peaceful and happy place in which to relax, contact us. Our units are not staying vacant for long these days, so if you do need to book accommodation, please be quick, as we hate turning people away. - the friendly, helpful and caring service is second to none! Don't forget - book with us directly and get rewarded for your loyalty! Ask about our special loyalty offers. *Free shuttle to and from the airport and some other destinations. (*Subject to availability). There is a small charge when booked through other sites. - Free shuttle to and from the close by Papanui Club. Welcome to the Garden City Motel, highly recommended by recent Trip Advisor reviews for excellent customer service and fondly known as “home away from home” to our many returning guests. Garden City Motel has exceptionally spacious and sunny units which are all smoke free and serviced daily to a high standard - come and experience for yourself the many reasons why people love to stay here! Great for business or pleasure. Free Wifi, free local and national phone calls, free booking for all trips and free, well lit off street parking, two disabled units. 6 Sky channels and all other free-to-air TV channels. Laundry facilities available, free use of BBQ, outdoor seating areas. Being an environmentally conscious motel, we endeavour to use chemical free products, where possible. Sample our yummy organic fair trade coffee from Peru while you’re here! Being set back from the road, the motel offers genuinely quiet units allowing for a great sleep, while the main road offers the convenience of public transport, with a city and airport bus stop only metres from the front door. Free shuttle to and from the Casino. We can also arrange transport to the airport, train station etc. Our location is great; we're situated roughly halfway between the central city and Christchurch airport (both approximately 10 minutes drive). We're close to Hoyts movie theatres, St Bedes College, Papanui gym and pool, Northlands Mall and Northwood and Merivale shopping centres, Burwood Hospital and the beach. Costas Greek Restaurant, Joe’s Garage and the Lone Star Bar & restaurant are just 2 of the many eateries that surround us and we’re one of the closest motels to the Papanui Workingmen’s Club. Good proximity to the Antarctic Centre, Orana Park, Willowbank, Ko Tane Maori Village, Clearwater, Pegassus and Waitekere golf courses and many first class wineries. 90 minute drive to major ski fields. Kiwi hosts, who speak fluent French and partial German. Members of the Motel Association NZ. Short and long term guests welcome. Long term EQC enquiries welcome also. Garden City Motel comprises 2 studio units, 6 one bedroom units and 2 two bedroom units. Two of our motel units are access units, with wheelchair ramps and large walk in bathrooms, all with handrails. Our units are more spacious than most, offering comfort to both short and long term guests. 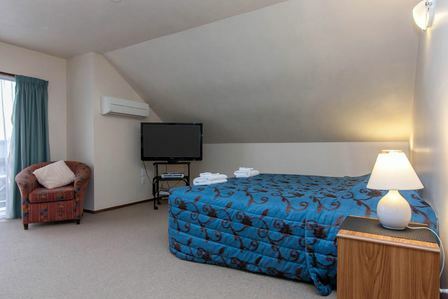 The room configuration and location make the Garden City Motel perfect for school groups and sports teams. Laundry facilities available, BBQ available for guests' use during the summer months. Baby's cot, highchair bath and guest laundry available. Well lit, off street car parking is available. QUEEN STUDIO (1): A cosy downstairs unit, with tea/coffee making facilities, toaster, fridge/freezer, microwave. Queen bed, ensuite. 42" plasma TV, heater. Free Wifi, free local and national calls. 6 Sky TV channels. KING STUDIO (1): An upstairs unit with it's own private patio. King bed, tea/coffee making facilities, toaster, fridge, electric frypan, microwave, ensuite. 42" plasma TV, heatpump/air cond. Free Wifi, free local and national calls. 6 Sky TV channels. SUPER KING STUDIO (2): Spacious studio unit, full kitchen facilities with oven, fridge/freezer, microwave. Lounge = Super King bed. 42" plasma TV, heat pump/air cond. Free Wifi, free local and national calls. 6 Sky TV channels. *If required, this unit can convert to a 1 bedroom unit, which has 4 single beds. ONE BEDROOM UNIT (4): Spacious units, full kitchen facilities with stove, fridge/freezer, microwave. Super King and single bed in lounge, 2 single beds in bedroom. 42" plasma TV, heat pump/air cond. Free Wifi, free local and national calls. 6 Sky channels. For reservations and enquiries: Freephone 0800 330 456 (within NZ) Phone:(03) 3524-059 Fax (03)3524-058 Email: info@gardencitymotel.co.nz.